Nobody likes ticks. They crawl into your hair, they bite, and they spread disease. Lyme disease – spread primarily by deer ticks – can stay with you for life, causing pain and chronic fatigue. While this disease is most common in the Northeastern US, it’s a danger throughout the country. Even if you’re in a region where Lyme disease is uncommon, ticks are still a creepy parasite. As with most bug problems, an ounce of prevention is worth a pound of cure. If you find that ticks are coming into your house, you’ll need to protect both your home and any pets that go outdoors. 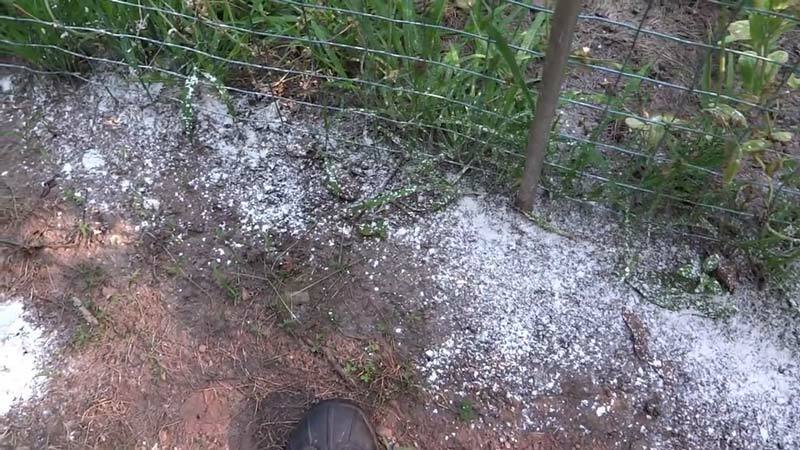 You could do this with a commercial pesticide, but there’s an all-natural way to protect your family: diatomaceous earth. Diatomaceous earth is a silica dust that’s made from tiny, fossilized sea creatures called diatoms. 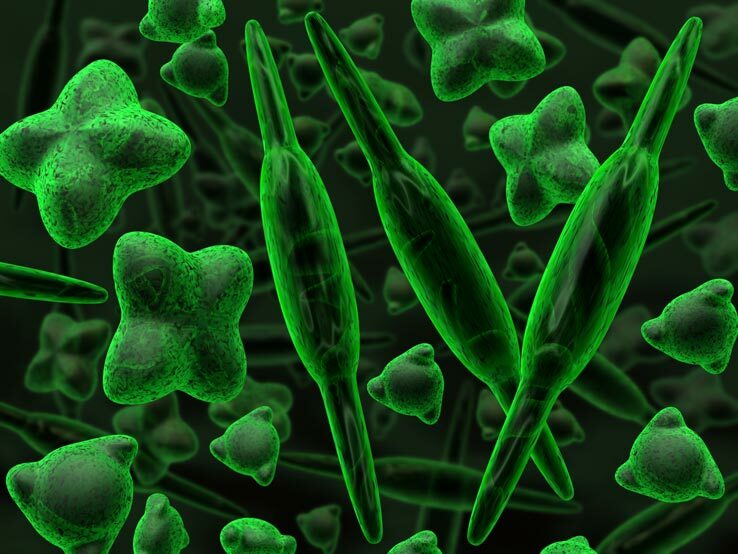 Diatoms are microscopic, but they leave behind tiny, porous shells that collect on the bottom of the sea. When these shells fossilize, they create an extremely porous powder that we call diatomaceous earth. Since diatoms have been around for hundreds of millions of years, and since a lot of dry land was once underwater, rich deposits of diatomaceous earth can be found throughout the world. This versatile powder isn’t just used for killing pests. It’s also used as a fire retardant, as an absorbent, as a kitty litter ingredient, as an abrasive, and even as a stabilizer to keep explosives from going boom when you don’t want them to. Some grades are even edible, and are used to track nutrient absorption in farm animals. Diatomaceous earth is effective as a pesticide because it’s so absorbent. Arachnids like ticks, as well as insects, depend on tiny pores in their shells to breathe. These pores need to be moist to function, so bugs’ exoskeletons have a thin, oily coating. Diatomaceous earth is fine enough to stick all over bugs like powdered sugar on a donut. This dries them out, causing their pores to shrink and ultimately suffocating them. There’s a common misconception that it works by cutting insects, because it has tiny, sharp edges. This is only true when it’s being used on snails, slugs or other mollusks. Their skin is delicate enough for diatomaceous earth to cut it. Ticks’ exoskeletons are far too tough for this, but they’ll still dehydrate if they can’t breathe. Diatomaceous earth is safer than chemical pesticides. Chemically, it’s 100 percent safe. You can even eat it – provided it’s been sterilized. The danger to humans comes from the tiny edges on all the fossils, combined with the fact that it’s fine enough to become airborne. When you breathe it in, it has the same effect as concrete and other silica dust. The tiny particles can become trapped in your alveoli, the tiny air sacs in your lungs that absorb oxygen. Over time, they can make tiny cuts, increasing the risk of cancer and emphysema. A less serious concern is that diatomaceous earth dries out your skin. You won’t suffocate from this like a tick would, but it can cause itching and flaking if you don’t wash it off and moisturize afterwards. For these reasons, you’ll want to wear a dust mask and a pair of gloves while you’re spreading diatomaceous earth. Better yet, you can use a diatomaceous earth applicator to avoid using your hands altogether. You’ll also want to keep it away from small children, who may play in it, kick up clouds and inhale large amounts. Finally, you should only use food grade diatomaceous earth inside the house. Why? Because it goes airborne, and even in the best or circumstances, some is going to get on your food. Diatomaceous earth comes out of the ground, and can harbor bacteria, potentially making you sick. Food grade has been sterilized, and is 100 percent food safe. 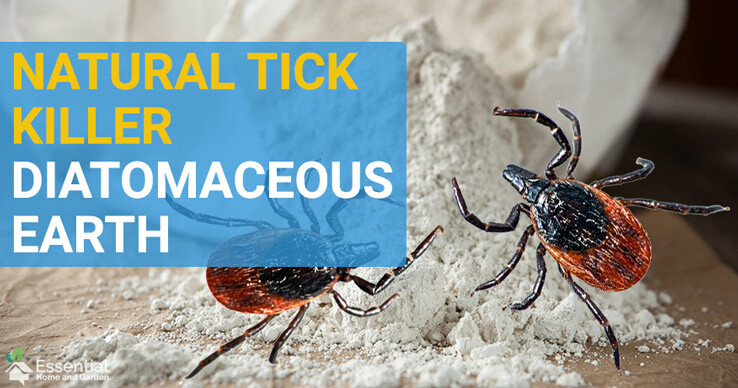 First, you’ll want to determine how the ticks are getting into your home to begin with. If you have a pet, make sure they have an up-to-date flea and tick collar, or use flea drops regularly to keep them protected. If they’re not safe, neither is the rest of your family, since they can bring ticks in from outdoors. Besides which, dogs and cats can also get Lyme disease, so you should also protect them for their own sake. Besides hitching a ride on pets, ticks can also enter your home through small cracks in the foundation. This happens most frequently in the autumn, when falling temperatures cause the ticks to seek out warmer environments. 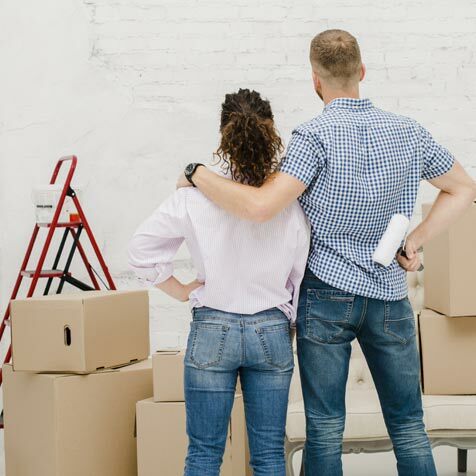 To protect these areas, sprinkle a line of diatomaceous earth around your home. It doesn’t have to be particularly wide – an inch or two is plenty – but it should be continuous. You’ll want to replace this line every time it rains, since diatomaceous earth needs to be dry to be effective. But suppose you already have ticks in your house, and you suspect there may be more? 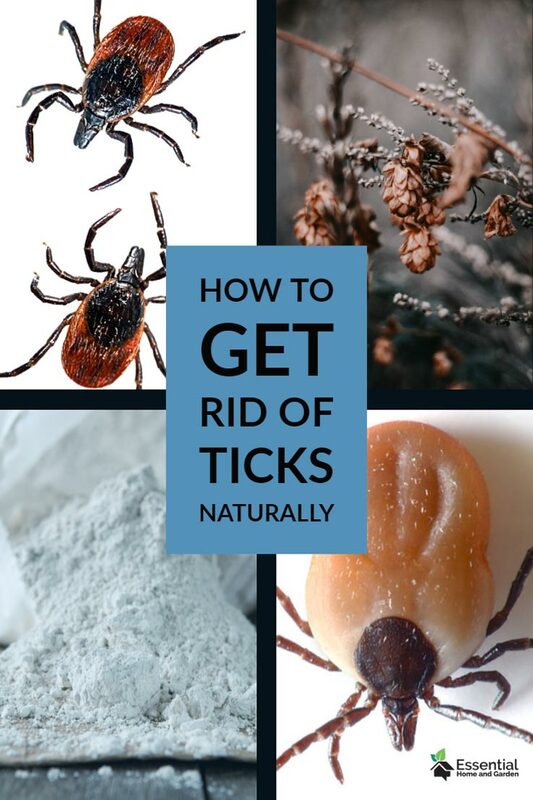 Ticks can survive for months without feeding, and may lay eggs in that time, spawning hundreds of tiny ticks that are dying to latch on to you or your pet. First, you’ll need to clean. This means taking a vacuum to every carpet, sofa, curtain and bedspread in your home. Hardwoods should be vacuumed, too, since ticks can hide in the cracks. To treat your clothes, wash them on the highest possible heat setting, and dry them on the highest heat that’s safe for the material. Using rubber gloves – or our applicators – spread diatomaceous earth around the edges of carpets, around your baseboards, and in front of entry doors. Again, a line a couple inches thick is more than enough to get the job done. Leave the treatment down for a week, then vacuum it up. When cleaning up diatomaceous earth, make sure to use a shop vac with a fine dust filter. Less powerful filters won’t catch all the dust, and it will end up blowing out the back of your vacuum, getting dust everywhere.